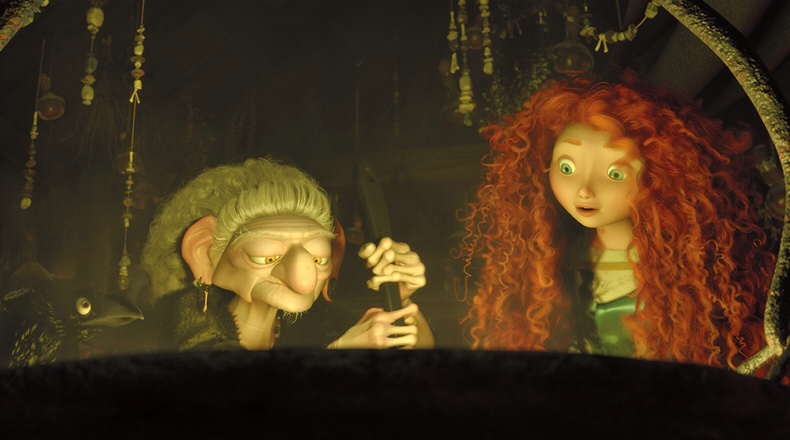 Being of Scottish decent, I thought Brave was an exceedingly entertaining movie. This movie had me from the "ma wee darlin'". It was delightful. Merida, a Scottish girl grows up as a princess. Her mother is overbearing and pushes her into fulfilling her royal duties and being a lady every moment of her life. However, her father's strong influence has made her much more of a warrior than a homemaker. Her mother surprises her by summoning all the clans together to find her a proper husband. This is the last thing strong-minded Merida wants. At the gathering of the clans, she goes into full rebellious teenager mode and shows off her superior archery skills, mortifies her mother, and flees into the woods on her trusty steed. It is there she finds a witch who gives a potion to help solve her problems with her mother. Little does she know that dabbling in the dark arts is not a toy to be commanded, and she soon veers her life into something more akin to Paranormal Activity and less like Cinderella. Her rebellious actions and attitude drives her away from those she loves and into the waiting arms of the witch. As we learned, witchcraft and magic is not some game we can use to fulfill our desires. It is dangerous and brings us to place we should never have gone. The interesting thing about this movie is that is almost as if someone read about King Saul and his foray into the "Darkside", and then wrote a screenplay around it. I must say, I was truly impressed with this take on witchcraft that I have never seen from Disney, which typically treats magic as a benevolent force for our good to make our lives better. Thank you, Disney, for showing witchcraft for what it is. At best witchcraft is an unknown quantity, and, much more typically, a malevolent force wanting to hurt us and our relationships. "Fate be changed, look inside, mend the bond torn by pride." As we learn, she humbles herself and Satan (the spell) flees. For once, it was not the act (repairing the tapestry), but an attitude (humbling herself to her mother and asking her to forgive her). As a child of God, seeking to please Him, the evil one does not have a chance. We need not fear. The Lord is our protector and He contends for us!